If your looking for hippie Elephant printed trousers, yoga pants for the gym or something a little bohemian then check out our range of elephant patterned designs. Our support together goes to the Baanchang Elephant sanctuary in Thailand. We are proud to confirm that our range is made from sustainable resources and with Fair Trade in focus. Free UK delivery plus delivery world wide. We are passionate about the survival and protection of all Elephants - and support the Baanchang Elephant's Paradise - with £s donated for every sale. These beautifully crafted trousers are hand made in Thailand. They are constructed from 100% Super Soft Rayon material, that is both lightweight but strong & resilient. This style comes in one size with an elasticated waist designed to fit 20 - 42 inches. 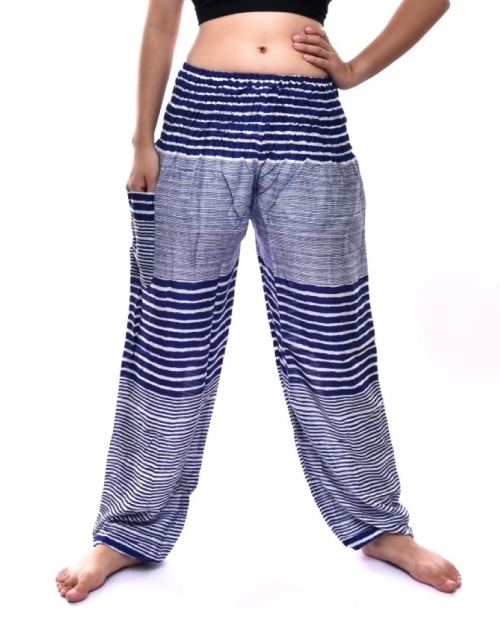 These beautifully crafted trousers are hand made in Thailand. They are constructed from 100% Super Soft Rayon material, that is both lightweight but strong & resilient.This style comes in one size with a fully elasticated waist to fit 20 - 42 inch waist.